Patients with poor ovarian reserve are frustrating to treat. They have few eggs , and often the quality of their embryos is not very good either. Typically, we get only 1-2 good embryos to transfer for them in each IVF cycle, and the pregnancy rates are poor. A lot of patients believe that if we were able to transfer more embryos for them, the chances of their getting pregnant would increase. This makes a lot of intuitive sense - after all , if the chance of an embryo implanting is 10% then if you put three embryos , the chance will increase to 30%. However, since they don’t product enough eggs in one cycle, a lot of doctors resort to pooling embryos. 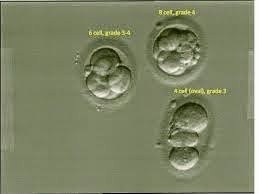 They do multiple super ovulation and egg retrieval cycles; fertilize and freeze all the embryos ; and then , once they have three or four embryos, they transfer all the embryos at one time in a single cycle. They hope - and so do their patients, that this approach will increase their chances of getting pregnant . However, this is an option that makes absolutely no sense - and all it does is waste time and money. Let me explain why. First, we need to understand that more is not better , and just because you transfer more embryos doesn’t mean you increase the chances of a pregnancy. After all , if one particular embryo is going to implant , then transferring just that one is enough ! On the other hand, if the embryo is not going to implant, then simply transferring four at a time doesn’t mean that the chances of getting pregnant increase. If neither of these embryos are competent enough to implant and become a baby, then they will fail to do so - whether they are transferred one at a time, or four at a time ! Also, just because you do egg collections over multiple cycles doesn’t increase the number of competent embryos you are going to get . The big disadvantage is that not only does this consume time and money,it distracts patients from considering the option which maximise their chances of having a baby - that of using donor eggs. The chances of poor quality embryos implanting will remain poor, whether you transfer one or your transfer four together. After all, if the oranges are sour, the juice will also be sour, whether you use 5 oranges, or 50 ! Let’s assume you had 10 lottery tickets to buy , and you had two choices - you could buy all 10 lottery tickets in one month or you could buy one lottery ticket over 10 months. How could either option possibly make any difference to your odds of winning the lottery ? If one of those tickets is a winning ticket , you will win with that ticket , whether you bought them all at a time , or once a month. And if none of those tickets is a winning ticket , then buying them all at one time doesn’t help. This is why transferring a number of pooled embryos ( which have been created over multiple IVF cycles ) in one single cycle is unlikely to work. It's true that transferring more embryos does increase the chances of getting pregnant, but there is no advantage to doing it in one shot , or doing sequentially over a period of time . If the endometrium is good , then you should go ahead and transfer the embryo , even if you have only one. However, if the endometrium is poor, then freeze all your embryos and then transfer them once the lining becomes optimal - and this is true whether you have 1 embryo or 10 embryos ! Remember that each embryo is a self-contained unit, which does not affect what happens to the other embryos which are transferred along with it. Each embryo has its own fate , and whether you transfer them four at a time , or whether you put them in one at time , will not affect what happens to the embryo.